Manchester - Pep Guardiola admits injury-plagued Manchester City defender Benjamin Mendy faces an important challenge to prove his long-term fitness and reliability over the final weeks of the season. Mendy has seen his career hindered badly by injuries since his move from Monaco nearly two years ago. The 24-year-old has started just 13 league games for the defending Premier League champions in that time, and played only 11 minutes of football since the start of November as he has battled back from a series of knee injuries. Mendy has been in full training this week but, when asked if he is confident that Mendy can return to the high levels of form he displayed at the start of his City career, Guardiola conceded the left-back must prove -- and maintain -- his fitness. "If he has consistency -- two months, three months, no injury -- he will come back without a problem," said Guardiola. "But if he comes back, then comes back again three months later, then two weeks, then three months, no. "Most important is a week's training, day-by-day, and if that happens with a good reaction in the knee, of course he will come back. "I think the physicality is not a big problem. It's more what we want to do, what we're looking for, the spaces, the rhythm and the pace. "Sometimes you need time when you don't play but I don't have doubts. "He knew he needed more in his knee. He's a strong guy but he needs power to sustain his efforts. He's getting better but he needs more time." Mendy's off-field antics and social media profile have made him a hit with City supporters, although not always with a manager who has been forced to question his professionalism at times. However, when asked about Mendy's current mindset and his desperation to rejoin City's quest for honours, Guardiola is in no doubt that the player needs more time before rushing back to action. "Desperate is not the word but he's here in Manchester to play football and when he can't play he's a little bit sad," Guardiola said. "But the body needs time after two big injuries, the second one as well. We are optimistic he will help us between now and the end of the season." Guardiola refuses to talk in detail about City's potential for adding the Premier League title, Champions League and FA Cup to the League Cup they won in February - a chase for what would be an unprecedented quadruple in English football. But, with the possibility of sweeping the board in the next 15 games, Guardiola is reluctantly being drawn into more discussions about such prospects. Only two other teams in English football history have gone this deep into a season still eyeing the quadruple. But Chelsea's dreams of winning four trophies ended on May 1, 2007 and Manchester United's on April 19, 2009. 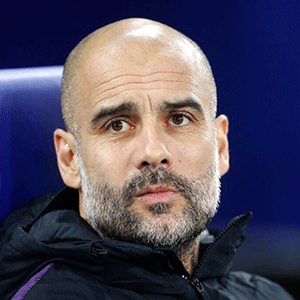 "In three days we have Cardiff, then after three days the semi-final of the (FA) Cup, then after Champions League with Tottenham, then Crystal Palace on Sunday and I know how difficult it is at Selhurst Park," said Guardiola, ahead of the league visit to Fulham on Saturday. "It's nice to live that. We spoke about that with the team. "We are privileged to be in all the competitions almost at the beginning of April and to fight for the title. "It's an incredible experience. I don't know how many teams in Premier League history have been in this position fighting for four title. "We are, and it's good. I think they are fresh mentally and in the legs and we are going to try."